Just never got in the habit of using that key. As for the FOB on the seat . What can I say S Happens . Yea, I've almost never taken that key out, and mine has always worked fine. I have also noticed that using that key in the tank or the bags, it would be pretty easy to bend. If you leave it outside, that key is the only thing that protects the electronic locking mechanism housed underneath from the weather. I know when I first got mine I was kind of freaked out about leaving that key in there. But without that FOB, these things don't go no where, without a truck with a crane. Just try to register one of these things without the FOB. I don't leave my Yamaha TW 200 outside at night because it's so easy for two guys to lift the locked front tire off the ground and walk the bike down the street. I'd just love to see them try that with my Conni. So Funny. No one carries a Conni more than a few feet. ...however I am no more enlightened as to why some members swear to leaving the key untouched? What's up with not removing the key? I think some folks may be a bit heavy handed. Using it as a lever for the gas cap etc. Just a slight tweak is all it takes. If your gentle like a new kitten it seems OK. To many reported bent key prob's for me to chance. I use the spare. Its a pretty common fact that the gascap latch/lock does at times become a bit sticky... and coupled with hot temperatures, makes it necessary to press down the cap when turning the key/unlocking it.... but most folks twist the key too hard first off when it offers resistance, thinking that helps... when simply pressing down on the cap to reduce the friction on the latching bar and gasket seal which is spring loaded, makes turning the key without damage a logical solution... I lube the latch bar yearly, with a small schmeer of lithium grease, to prevent that. I never set my fob on the seat... it goes back in my coat pocket as soon as I pull out the small key to open my tank.. and when I close the cap, I still press down on it, and give the key a couple back and forth twists to keep the lock movement "excersized" before returning it to it holder...and back to pocket. I NEVER set the FOB on the seat either except for the time I did and rode off into the sun . Then rode all the way back to find the f Fob still on the seat .But hey, I didn't have to buy another one. I found this whilst reading elsewhere. It's interesting. This might be handy, you never know! 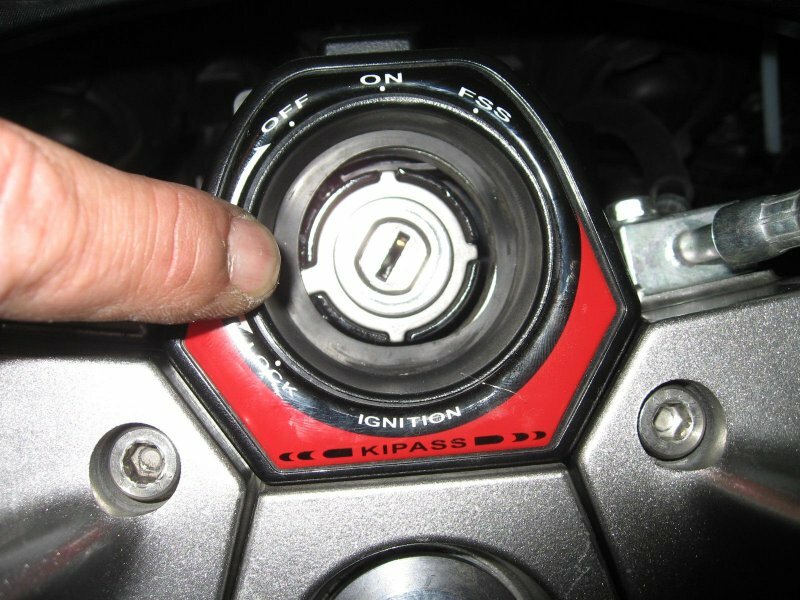 The old joke around here was you need a special "K-Rock" and then use it to tap the ignition switch at the 9 oclock position to free up the switch, but the truth is any ole rock will do, you don't need to buy the special Kawasaki rock. I am wondering if the OP ever got the key out. I am beginning to think perhaps he was stopped by the side of the road when he wrote the original post, was unable to get the key out, then, not being able to go anywhere, he died of dehydration and was unable to come back to post again. I always use the key for the gas tank, and the bags as well. I do keep the locks in good shape though. They work as good as the day I bought the bike in 2010.